The tussle for dominance in the defence-offence equation has been a regular feature of human conflict over centuries. With the advent of Revolution in Military Affairs (RMA) and concurrent advancements in Information and Communication Technologies (ICT), there is a paradigm shift in the fundamental war fighting concepts. Unmanned Aerial Vehicles (UAVs) have emerged and grown against the backdrop of such fast-paced developments in modern battlefield. The accuracy, long range and fire power of advance weapon platforms such as Precision Guided Munitions (PGMs) are of no use unless they are complemented by matching surveillance, target acquisition, battle damage assessment and weapon guidance capabilities. Therefore, besides ground based assets and air borne early warning systems, UAVs assume importance for imparting “force multiplication effects” to air and surface forces. The US department of defence [DoD] defines a UAV as ‘’a powered, aerial vehicle that does not carry a human operator, uses aero-dynamic forces to provide vehicle lift, can fly autonomously or be piloted remotely, can be expendable or recoverable, and can carry a lethal or non-lethal payload. Ballistic or semi-ballistic vehicles, cruise missiles, and artillery projectiles are not considered unmanned aerial vehicles”. The operational concepts of UAVs are fast catching up because of the multiplicity of roles that can be performed by a UAV without risking human life, and even with the increasing costs it is still considered expendable as compared to manned aircraft. UAVs are effectively employed to provide real-time day and night reconnaissance, battlefield observation and surveillance of enemy shores and coastal facilities. Highly fused Intelligence, Surveillance and Reconnaissance (ISR) systems and processes permit advanced identification and understanding of adversary target systems greatly enhancing our strategic attack capability and facilitating Suppression of Enemy Air Defence (SEAD) operations. UAVs significantly complement the battlefield management functions such as directing close air support and armoured manoeuvre, artillery fire adjustment, radio relay missions and battle damage assessment. They are also employed for peace-time border surveillance, peacekeeping missions, operations by Special Forces and aerospace management in a Tactical Battle Area (TBA). Depending upon the payloads on-board, UAVs can be comprehensively used for Electronic Counter Measures (ECM), Electronic intelligence (ELINT) and Communication Intelligence (COMINT). The imaging payloads such as Electro Optical (EO) and Infra Red (IR) sensors, and non-imaging Signal Intelligence (SIGINT) payloads enable UAVs to constantly monitor radiation characteristics and operation timings of tracking and surveillance radars for day and night reconnaissance. Almost all low speed varieties of the UAV carry EO, IR payloads, thermal imaging sensors like Forward Looking Infra Red (FLIR) which can penetrate camouflage, and Synthetic Aperture Radar (SAR). UAVs can also share information with various Airborne Early Warning (AEW) platforms such as Airborne Warning and Control Systems (AWACS), Joint Surveillance Targeting Attack Radar System (JSTARS), Satellites, etc. Emerging and Enabling UAV Technologies for Future Operations. There is growing emphasis on the development of Unmanned Combat Aerial Vehicles (UCAVs). The armaments carried by UCAVs are miniaturized, Global Positioning System (GPS) guided, with stand off capability, taking on the task of identification, acquisition and homing on to targets. UCAVs play a crucial role in “pre-emptive” SEAD operations against Air Defence (AD) systems deployed in the TBA by locating and targeting mobile radars, ground-based weapon systems, command and control centres, and communication units. Some of the munitions being employed by UCAVs are Joint Direct Attack munitions (JDAM), cluster bombs and sensor fused weapons. Significant emphasis is being laid on acquiring enhanced loiter capability, automated launch and recovery techniques, enhanced combat radius for passage of data to and from other aerial platforms and target designation capability to other aerial platforms. The military is seeking sensors with high-definition television standards, foliage penetration radar with hyper spectral imagery, and MTI Mode to track targets in all types of terrain throughout the spectrum of military operations. The Tilt Wing Rotary UAV System (TRUS) – a combination of rotary wing and fixed wing technologies is being developed to provide vertical take-off and landing capability and the ability to hover to facilitate maritime operations and Special Naval Tasks. Modular Integrated Communication and Navigation System (MICNS) is being developed to provide UAVs with a wide range of hardened, anti jamming communications and control capabilities. Substantial investments are being made in developing a new class of unmanned platform-Miniaturized Air Vehicles (MAVs). It is a highly survivable aerial platform due to features such as all weather capability, small size, low acoustic and Infra Red signal, stand off capability, modular design, Electronic Warfare (EW) capability and rerouting. These compact, light-weight and stealthy air vehicles carrying miniature sensors are playing a key role in the war against terrorism. “He that will not apply new remedies must expect new evils ; for time is the gratest innovator”. Reconnaissance, Intelligence, Surveillance and Target Acquisition (RISTA) Missions. RISTA can be defined as “the process of integrating the intelligence process with surveillance, target acquisition and reconnaissance tasks in order to improve a commander’s situational awareness and consequently their decision making”. Integration of UAVs with other platforms is likely to enhance the utilisation of RISTA technologies to provide wide area surveillance and continuous coverage enabling the use of sophisticated weapons like ‘smart bombs’ and PGMs. Stealthy UAVs will likely play an increasing role in strategic reconnaissance and dominate airborne reconnaissance at all ranges. Conversely, the UAV-based air operations could also form the backbone of AD communication network. UAVs can also be employed suitably during the conduct of Information Operations (Figure-1 refers) in order to achieve information superiority by influencing the adversary’s information systems and processes, communication and data networks, while at the same time preventing him from doing the same to us. Naval Air Defence and Maritime Operations. UAVs can be employed to conduct timely reconnaissance on the perspective enemy forces that an Amphibious Task Force (ATF) may confront, provide target information to long range precision weapons and then follow up with battle-damage assessments of those targets. UAVs can also be employed in various maritime operations such as sea control, sea denial to the adversary, air strikes on strategic and tactical targets ashore and special operations as part of Special Naval Tasks. Data and Communication Relay System. A low cost UAV loitering at high altitudes can be used as a platform to relay surveillance data, ELINT information, etc. between two stations operating beyond the line of sight such as between the aircraft and the radar station or between the AWACS and command and control centre. The UAV based multi-band, multi-mode communications node can contribute as a force multiplier by supporting offensive operations, especially when a ground based communication network fails to keep pace with the operations in terms of physical speed, power, frequency, bandwidth and channel availability. Augmentation Of AWACS / AEW Systems. In the mountainous terrain of Jammu and Kashmir and the northeast, the performance of ground based radars is extremely restricted. To resolve this problem, UAVs can be equipped with smaller airborne radars with limited ranges to perform the role of gap fillers in the valleys and radar shadow areas. Data link with AWACS and other AEW systems can be utilised to augment the radar pictures and provide real-time target information. 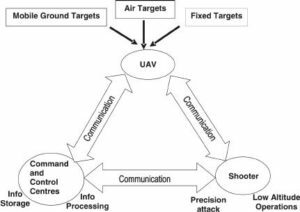 (a) Stealthy, weaponised and loitering UAVs can be employed to dominate much of the close-strike mission and can be exercised effectively even in built up areas. The use of UAVs over manned aircraft should be preferred against heavily defended targets due to their higher level of survivability and risk free use of force, whereas against lightly defended targets they may be preferred due to the low cost of conducting warfare. (b) UCAVs can be employed to attack high value fixed targets as well as support operations in the mission of strategic attack, interdiction and close air support. Strike aircraft and their complement of strike and air-control UCAVs can be employed by the Air Force in gaining and maintaining air occupation over contested territory. (c) UCAVs can be integrated with manned and unmanned assets like AWACS, fighter aircraft like F-16s, Global Hawks and communication satellites to play an important role in ‘pre-emptive’ SEAD missions in future (where the exact location of enemy SAM sites are known). Suppression of Enemy Air Defence (SEAD). The US DoD defines the term SEAD as “an activity which neutralizes, destroys, or temporarily degrades surface-based enemy air defences by destructive or disruptive means”. UAVs can be employed to detect enemy air defence systems, deploy attack weapon systems and provide Post Strike Damage Assessment (PSDA). Precise and accurate intelligence, space based guidance and navigational capabilities provided by UAVs can assist a strike aircraft in delivering the precision weapons accurately and generate ‘effect based bombing’ to ensure expeditious defeat of the enemy forces. COMINT, SIGINT and ELINT Unmanned Platforms. UAVs having COMINT payload on board can be employed to locate and identify enemy’s ground communication emitters, leading to detection of the locations of the enemy’s military leaders as they communicate with their forces. The real time SIGINT and data transfer or live video images will make the enemy’s electronic orbat transparent even before the hostilities have commenced and assist in planning offensive operations and SEAD. The UAV can also be operated as a “high altitude, long endurance and low observable platform” to support multiple strike operations. Besides jamming, the UAV can perform a decoy role by replicating the signatures of a manned strike aircraft. MAVs – An Emerging Paradigm. MAVs, have the tremendous potential for ISR operations. Portable MAVs can be carried and operated by individual soldier for local reconnaissance. At sea, MAVs can be deployed from ships to gather intelligence to prevent acts of maritime terrorism. They can be fielded in a hostile environment to detect people equipped with shoulder fired missiles. MAVs can play an important role in real-time detection and analysis of a biological or a chemical agent in an infected environment. They can also play an important role in humanitarian missions such as searching for survivors amidst rubble from earthquake. They can be integrated with manned, unmanned and satellite-based sensors to provide wide-area surveillance at low level of resolution to create a common operational picture of the battlefield. Swarm of MAVs equipped with sensors and miniaturized warheads can be employed to attack high value targets such as radars and launchers of SAM sites. (a) Simultaneous operations in geographically dispersed locations and utilisation of widely dispersed command and control elements, ISR elements and weapon platforms. (c) Information sharing will promote shared awareness, synchronisation across the networked forces and optimised employment of available resources within the time constraints. (d) Improved synchronisation yields greater mission effectiveness because of the speed of command, sharing of resources and increased lethality, survivability and responsiveness. UAVs have the potential to augment the capabilities of manned aircraft and act as the force multipliers. However, their potential application as tactical weapons in future operations will require recognising and incorporating future operational needs of the Services; the technologies and platforms to meet those needs, and ways to integrate those technologies so that they are cost effective and can be operated by a variety of war-fighting elements. Some of the existing operational and technological constrains have been mentioned in the succeeding paras. Advent of Precision Weapons. UAVs / UCAVs are likely to play only a limited role in electronic-attack missions as the prospective employment of electromagnetic-pulse weapons and directed-energy weapons will increase the risk of self-jamming for the unmanned platform itself. Ground Control Station (GCS), which is the hub centre for controlling UAV missions, is quite vulnerable because of its large size and modern precision weapons can be used against it. Vulnerability of Communication Support. The current satellite communication infrastructure is incapable of supporting sizeable numbers of UAVs or UCAVs since they are major consumers of bandwidths essential for real-time interactive command and control systems like flight controls, video reception and transmissions. The data link of the UAV to maintain line-of-sight communication with the ground terminal can be located by suitably homing on to these signals. UAV to UAV relay is a possibility for extending the line-of-sight operations, but this increases risk and costs due to employment of more UAVs airborne and operating at all times. Trade Offs Between Size and Capabilities. MAVs can operate within limited ranges due to their payload restrictions and are quite vulnerable to the inclement weather. To achieve survivability in missions, UAVs need to have a small size. However, need for power generation and weapon carriage could drive up its size and costs. Micro electro-mechanical systems, micro-manufacturing and nanotechnology could provide an exponential leap in micro-miniaturization of weapons, sensors and platforms. Autonomous Mode of Operation. An autonomous platform will have less flexibility and greater vulnerability; moreover, it can’t analyse its environment. The software complexity, automation and communication architecture of such platforms make them extremely expensive and operationally unreliable for many missions. Besides, the primitive nature of current target recognition programme implies that a human operator must be kept in loop to authorise the “kill”. Absence of Human Judgment. A manned aircraft provides the ability for a trained crew to evaluate large amount of tactical data in a high-threat environment and to change the mission plan as required for strike support. The appearance of a previously unknown threat may only be detected by a human operator’s ability to recognise patterns in the context of previous experience. This is very difficult to develop in an autonomous system. 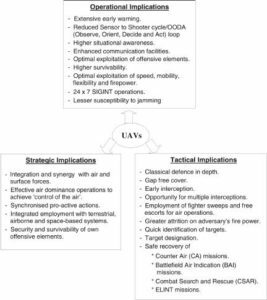 In the sum game, the “force multiplication impact” of employing UAVs as tactical weapons in future operations can be comprehensively defined in terms of its multifarious strategic, operational and tactical implications as explained in figure-2. UAVs will play a key role in mission areas commonly categorised as “the dull, the dirty and the dangerous”. They will provide a force with access to the fifth dimension of warfare, Information Warfare, in addition to land, sea, air and space, hence fully embracing their role in the ongoing RMA. MAVs will see their potential applications in homeland security such as urban operations, counter insurgency and anti-terrorism. UCAVs will be employed predominantly to carry lethal weapons and provide active sensors against potent anti-aircraft weapons. However, the proliferation of sophisticated counter air assets and advanced air defence systems worldwide is likely to put off UAVs from making significant in-roads into the force-application roles such as Counter Air Operations and ‘reactive’ SEAD missions. The technology driven transformations may even replace manned aircraft in a number of tactical and strategic missions of air warfare. Nevertheless, it must be kept in mind that UAVs are virtually the ‘force multipliers’ and future operations will always require unmanned missions to deal with rapid changes and uncertainties of war. @Lieutenant Colonel Piyush Kumar Sanwal was commissioned into a Light Air Defence Regiment in the year 2004. He has excelled in major professional courses.